Note: In 2016, ASTM A325 was officially withdrawn and replaced by ASTM F3125, in which A325 now becomes a grade under the F3125 specification. The F3125 specification is a consolidation and replacement of six ASTM standards, including; A325, A325M, A490, A490M, F1852, and F2280. We are choosing to keep this technical information about the now obsolete A325 specification on our website for reference and informational purposes only. Prior to its withdrawl in 2016, the ASTM A325 specification covered high strength heavy hex structural bolts from 1/2″ diameter through 1-1/2″ diameter. These bolts are intended for use in structural connections and therefore have shorter thread lengths than standard hex bolts. Refer to the Structural Bolts page of our site for thread lengths and other related dimensions. This specification is applicable to heavy hex structural bolts only. For bolts of other configurations and thread lengths with similar mechanical properties, see Specification A449. Bolts for general applications, including anchor bolts, are covered by Specification A449. Also refer to Specification A449 for quenched and tempered steel bolts and studs with diameters greater than 1-1/2″ but with similar mechanical properties. Note: Nuts conforming to A194 Grade 2H are a suitable substitute for use with A325 heavy hex structural bolts. The ASTM A563 Nut Compatibility Chart has a complete list of specifications. 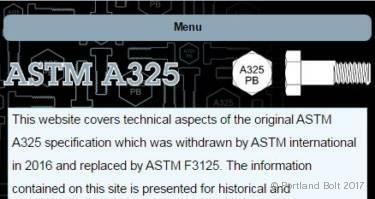 You can find more ASTM A325 information and FAQs on our A325-focused microsite www.a325bolts.com.